Ursula K. Le Guin is one of science fiction's greats: her stories Left Hand of Darkness, A Wizard of Earthsea and The Dispossessed rank among the genre's best works, and she moves easily between science fiction and fantasy, writing things that science fiction authors had barely touched before she came onto the scene. To say she was influential is to undersell one's words. I have to say, of all of Le Guin's works that I've read, the ones that I've enjoyed the most was A Wizard of Earthsea, which I read years ago. Of all the fantasy novels I've picked up, it's probably one of the ones that's stuck with me the most. I'll say this once: there's some columns that have come together quickly. Others are far harder to put together: case in point, trying to summarize the influence of one of the genre's greatest living figures, Ursula K. Le Guin. Never mind that her fiction still challenges me and makes me feel incredibly tiny, or that her words are something that I can hardly imagine coming close to in style or grace. This was a hard one to write, but rewarding, all the same. 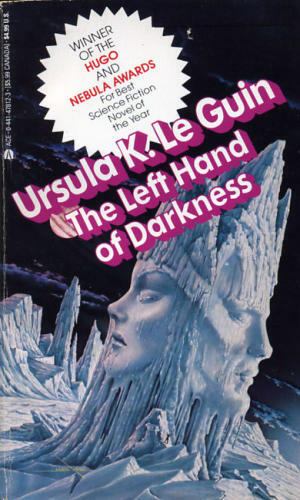 Go read The Left and Right Hands of Ursula K. Le Guin over on Kirkus Reviews. Trillion Year Spree: The History of Science Fiction, Brian Aldiss. Aldiss devotes a number of pages to Le Guin and her influence on the genre, holding her critically at arm's length, which is interesting to see: few authors have really had this treatment in this particular book. He acknowledges her stance in the genre, but chastise her for being preachy. In Other Worlds: SF and the Human Imagination, Margaret Atwood. Atwood actually dedicated this collection of essays (which is very reminiscent of Language of the Night), and devotes one essay to her, where she discusses her fiction in a very useful way. Ursula K. Le Guin: A Critical Companion, by Susan Bernadro and Graham J. Murphy. This is a dedicated volume on Le Guin, and I found it to be exceptionally helpful with some publication details and commentary on her works, especially the stories I haven't read (yet). Understanding Ursula K. Le Guin, by Elizabeth Cummings. Another critical survey, this one likewise had some helpful commentary and details. The Jewel-Hinged Jaw: Essays on Science Fiction, by Samuel R. Delany. Delany's complicated survey of the genre is a dense, detailed one, and contains a good section on The Disposessed. The Dreams Our Stuff is Made Of: How Science Fiction Conquered the World, by Thomas Disch. Disch's history is a decent one that I've used before, but I was a little surprised to see him absolutely castigate Le Guin and other feminist authors here. The Language of the Night: Essays on Fantasy and Science Fiction, by Ursula K. Le Guin. Le Guin's book of essays on science fiction and introductions to her book is possibly one of the best non-fiction books that I've read on the subject. It's an excellent demonstration that Le Guin is an utterly powerful, brilliant and intimidating figure in the genre. Le Guin, Ursula K. The Encyclopedia of Science Fiction has a good section on Le Guin and her influence. (As well as The New Wave). Ursula K. Le Guin, The Art of Fiction No. 221 This interview with Le Guin was particularly helpful for some publication details, but also for simply getting a sense in a serious setting, how Le Guin speaks with people. (I wish I was sitting in the room for this one. Ursula K. Le Guin discusses Lord of the Rings Short video on how Lord of the Rings was influential. Ursula K. Le Guin discusses Earthsea Short video on Earthsea. The Clients of Agent Virginia Kidd. I actually came across Le Guin earlier in this column with my article on Virginia Kidd. For part of my research there, I interviewed Mrs. Le Guin, and she was extremely helpful in providing some answers for my questions.